Curtin University strives to give high achieving students around the world the opportunity to pursue their ambitions and gain a world-class education. Through the 2015 Curtin Innovative Merit Scholarships 2016 and 2016 Curtin Innovative Merit Scholarships Curtin University welcomes eligible students who are citizens of Bangladesh, Botswana, Brazil, Brunei, Canada, Chile, China, Colombia, Costa Rica, Hong Kong, India, Indonesia, Kenya, Malaysia, Mauritius, Mexico, Myanmar, Nepal, Nigeria, Pakistan, Philippines, Russia, Singapore, South Korea, Spain, Sri Lanka, Thailand, Turkey, Vietnam, Zambia and Zimbabwe. This scholarship category awards eligible students starting in Semester 1 or 2, 2015 and Semester 1 or 2, 2016, 25% of their first year of tuition. For students awarded a place in Curtin University’s Faculty of Science and Engineering through this Scholarship, the Faculty is proud to offer them an exciting opportunity to access an ongoing merit-based scholarship for the full duration of their undergraduate program. The Science and Engineering International Merit Extension Scholarship is designed to award high achieving students, who commenced the first year of their program through the 2015 Curtin Innovative Merit Scholarship or the 2016 Curtin Innovative Merit Scholarship 25% of their annual tuition fee providing they achieve and maintain a course weighted average (CWA) of 75 per cent or above. Curtin University acknowledges the importance of being one of Australia's most multicultural university campuses and this scholarship aims to grow the trust and confidence in Curtin University as a place for students to further their studies, careers and life experiences. - Must be citizens of Bangladesh, Botswana, Brazil, Brunei, Canada, Chile, China, Colombia, Costa Rica, Hong Kong, India, Indonesia, Kenya, Malaysia, Mauritius, Mexico, Myanmar, Nepal, Nigeria, Pakistan, Philippines, Russia, Singapore, South Korea, Spain, Sri Lanka, Thailand, Turkey, Vietnam, Zambia and Zimbabwe. - Students must achieve and maintain an ongoing course weighted average of 75% or above. International Future Student Services is located on the Bentley Campus (Building 102). Our office is open from 9.00 am – 4.45 pm, Monday to Friday. 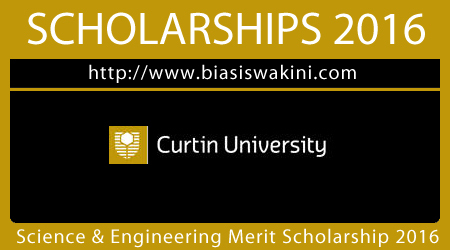 0 Komentar untuk "Curtin University Science and Engineering Merit Extension Scholarship 2016"